Protecting from sun, rain and wind – a pop-up gazebo is undoubtedly a precious ally during family trips or outdoor events of all kinds. Boasting a portable design and available in a wide range of styles and sizes, these temporary structures are even suitable for commercial or promotional purposes. But with a wealth of options on the market, how to choose the best one? Finding the right option that withstands the temperamental British weather can be difficult. That’s why our expert team has selected, tested and rated some of the most popular models on the market. Check out our top picks below. Our top pick – a heavy-duty pop-up gazebo suitable for all uses. Designed to withstand harsh weather, it comes in seven colours and matches all landscapes. A low-cost yet versatile gazebo suitable for light duty use. Coming with or without side walls, it provides perfect shade in the sunniest days. Simple unit, ideal for the back garden, beach or event. Well structured with a flexible configuration. Stylish and nearly 3m in height. Water resistant with an anti-pooling system and stylish hexagonal design. Smaller than other units but easily assembled with simple pop-up feature. Removable side panels. Plenty of room with a 9m² interior. Doesn’t have side walls or wind protection. All Seasons is a premium heavy-duty gazebo ideal for all uses. The simple pop-up design with no poles to slot in guarantees an easy erecting of an instant and portable shelter. Folding like an umbrella, the structure is also easy to dismantle and store in its wheeled carrying bag. Ropes, four leg weight bags and tent pegs secure the structure on almost all surfaces, including grass, decking, patios, sand, and even on a large balcony. A fully waterproof heavy-duty canopy protects from sun but also from rain, while the structure is incredibly sturdy and resistant. The roof is made of PVC coated polyester while the matte black powder coated frame is rust resistant. Twenty-four build-in support struts within the roof and around the edges eliminate the need of wind bars, increasing the overall resistance of the structure in all weathers. This unit is also spacious yet compact enough to fit in tight spaces. It has a footprint of 3x3m, approximately 7ft clearance around the edges at the highest setting and three height settings that add versatility. For peace of mind, the product comes with a 1-year manufacturer’s warranty and a care guide. One slight downside is the lack of side walls, although they can be purchased separately. Erecting the unit is simple thanks to the pop-up design with no slot-in poles. Just pull the legs out and secure the roof cover on the frame. Roof cover is made of 260g/m² PVC-coated polyester. All stitching and pressure points are reinforced and the roof can be left on for future uses. Comes with standard 1-year manufacturer’s warranty for frame parts. The structure is lightweight and easy to transport. The gazebo weighs 21kg and it comes with a convenient carry bag with wheels. Heavy-duty canopy is fully waterproof (not just shower proof) and the frame is powder coated for rust resistance. Folding design ensures a quick and easy dismantling. The product comes with no side walls – they are sold separately and will increase the total cost of the product should you need them. Even though reinforced, the canopy might wear out fast, especially in the corners; canopy damage is not covered by warranty. With a frame made of powder coated steel tubes and a flexible configuration of the side panels, Slimbridge Saltney is a great product for residential or commercial use. It comes with either three, two, or no side walls, it is easy to assemble and has a more than affordable price. Our favourite and the most versatile is the version with three side walls. The panels are made of water-resistant 90g/m² fabric; they are removable and easy to put on or take off thanks to the convenient Velcro fasteners. The fabric provides a decent protection from elements and large church style windows present on each panel allow sufficient light to get through. However, if budget is tight or side walls aren’t necessary, choosing one of the other two options could save you some money. We’re not too fond of the steel structure; the tubes are thin and weak. This means poor resistance to rain, as an accumulation of water on the roof combined with strong winds can bend the frame. For this reason, the manufacturer recommends dismantling the structure and storing it indoors overnight. This is obviously not ideal. However, for good support and stability, we recommend anchoring the product with leg weight bags and ground pegs. If you think erecting and dismantling the structure constantly is too much of a hassle, definitely consider investing in a higher quality product. 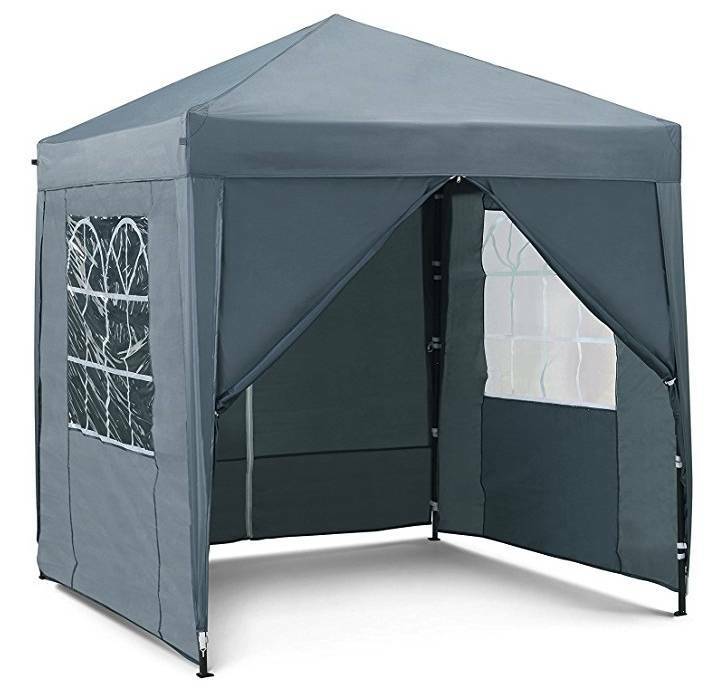 Removable side panels with Velcro fasteners ensure an easy configuration of the gazebo. Large church windows on each side walls allow plenty of light to get through. Covering an area of 9m², this gazebo is spacious and perfect for multiple uses. The footprint is 3x3m, and the structure stands 2.8m tall. Powder coated steel poles and durable connectors ensure an easy erecting and dismantling of the structure. 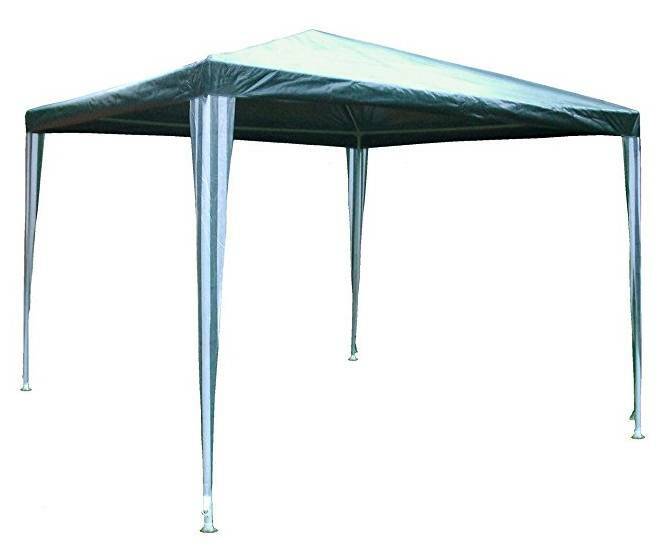 Water resistant 90g/m² fabric canopy and side walls ensure a decent protection from elements. A low-cost product available in three design configurations, with or without side walls. Wind and rain could damage both the frame and the canopy. The product has an overall poor resistance. The unit shouldn’t be left unattended overnight. If you need a more permanent structure, this might not be your best bet. Greenbay is a simple pop-up gazebo perfect for personal or commercial use. Offering a generous space yet rather compact footprint, the product finds its ideal place in a garden, on the beach, or even at a flea market or festival. The structure is given stability by four leg poles and support poles that attach to top poles and cross poles. A durable and water resistant top canopy provides protection from sun and the elements, while four side walls ensure adequate protection from wind. Two of the side walls are fitted with church style windows that allow a decent amount of light to pass through, while easy access is ensured by zipper doorways located on the other two walls. Two free wind bars and four leg weight bags included in the box increase the product’s strength and stability. The top canopy and side walls are made of 420D oxford fabric coated with a silver water-resistant layer. With a 600mm hydrostatic head, this gazebo won’t keep you dry in all weathers, but it’s still water-resistant enough to use in light rains. We liked the flexible configuration of the product. The side panels are easy to remove if you want an open area in the hottest days – or closed to protect you from the wind and elements. Assembling and dismantling is easy; the accompanying carry bag keeps the product compact for easy storage and transport. With a 3x3m footprint, this product fits perfectly on a small property and is also ideal as overhead cover for a promotional or commercial stall. Compact yet spacious, the product has an overall height of 255cm and can comfortably accommodate most people. Anthracite colour is hard to stain and matches well with almost all outdoor settings. The product is also available in six other hues. 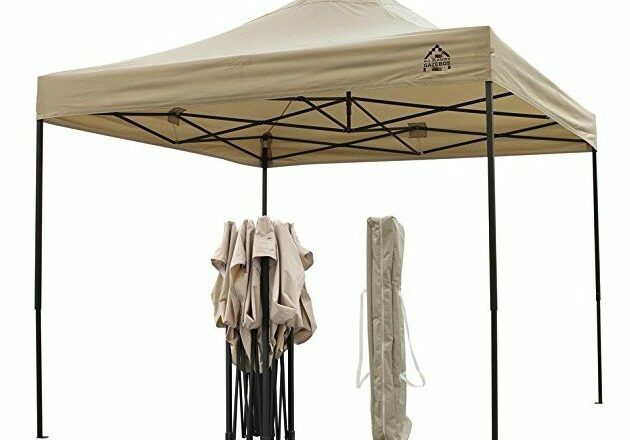 Gazebo comes with ropes, stakes, and a set of four led weight bags that add stability to the structure. Assembling, dismantling, storing and transporting the product is easy. A carry bag adds to its convenience. Strong winds may compromise the product’s stability and the roof might keep rain, resulting in leaks. Assembling the product is easy, but the operation requires at least two people. Also, assembling the gazebo or leaving it outside in bad weather may cause the cancellation of the warranty. Velcro straps secure the walls to the structure but might leave gaps around the corners. Superb hexagonal design – perfect to improve curb appeal! 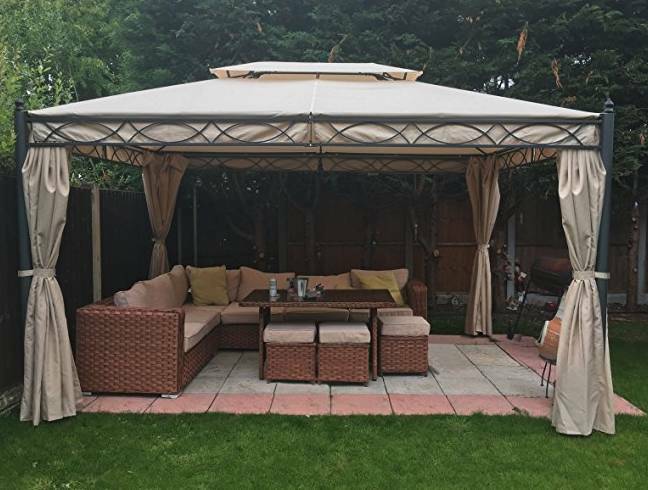 Horwood gazebo impresses with a superb design, a spacious interior and easy assembling. It pops up in minutes, and it comes with a resistant canopy and zipped insect curtains. Undoubtedly, a product able to add value to your outdoor space. What we like the most is the design. This six-sided hexagonal structure is stylish and fits in well with almost all landscapes. Measuring 3.6m x 3.1m, it also has a fairly compact footprint, while the overall height of 2.77m ensures plenty of clearance, making it possible to install outdoor lighting on the pavilion’s ceiling. Moreover, the width between the posts is 1.8m. Design apart, we also like the structure. The frame is sturdy and made of powder coated steel. Dark copper brown is an elegant colour that matches perfectly with the dark beige roof canopy made from quality woven 180g/m² PA coated polyester fabric. The fabric also covers the legs of the structure and hides the closures of the mosquito curtains. The canopy is water resistant and the design also incorporates built-in anti-pooling drainage. The unit is very effective in protecting from rain; however, like all gazebos, this is a temporary structure and it shouldn’t be left up unattended. If you don’t want to dismantle it, at least remove the canopy if you live in an area with strong winds. Although designed as a temporary structure, the frame is sturdy and the feet come with holes at the bottom that allow it to be secured to the ground if required. However, don’t expect it to withstand storms, strong blasts or heavy rains. Stylish and fits well in almost all landscapes. It is perfect for all occasions including formal events such as weddings. A dark copper brown powder-coated steel frame and dark beige heavy-duty canopy add elegance to the design. Erecting the structure requires less than half an hour and two people. Collapsible design makes it easy to dismantle. Comes with zipper mesh curtains that keeps insects at bay. The generous interior makes it perfect for family gatherings, reunions and other outdoor events. Velcro loops on the curtains are not sturdy and might break in time. The zippers could have been of a higher quality. VonHaus is a compact pop-up gazebo ideal for outdoor dining and partying in all weathers. Thanks to the 2x2m structure, the product fits in almost all outdoor spaces, while the sturdy frame adds resistance to the shelter. 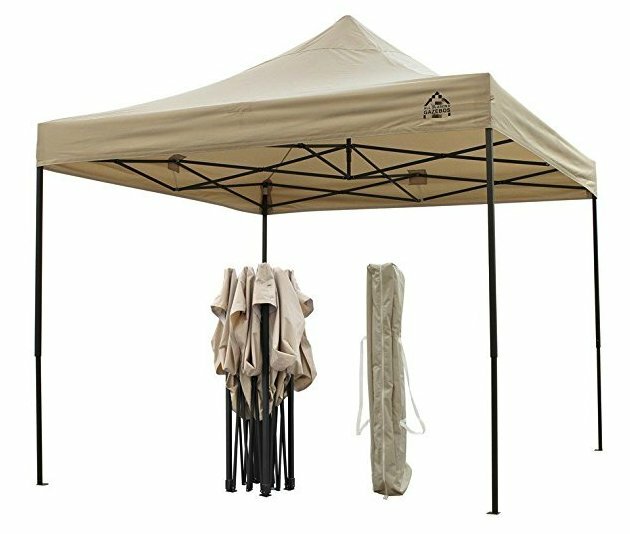 Available in soft grey or ivory, this shelter consists of a sturdy steel frame that withstands stiff breezes and a 420D oxford water-resistant canopy that withstands heavy rains. With a 4m² interior and a max roof height of 2.5m, this structure provides an ample room for entertaining while removable side walls add versatility. In fact, the shelter boasts a flexible configuration thanks to the removable side panels. On warmer days, it’s possible to exclusively use the stylish canopy, providing welcoming shade. On colder days (or if there is wind) the side walls allow for better temperature control and transform the canopy into a shelter. With the walls on, easy access is ensured by convenient zipper openings while two side walls feature large transparent windows that allow daylight to flood in, giving a bright and airy feel to the interior when the flaps are zipped together. Thanks to the pop-up structure, the unit can be erected, anchored and dismantled in minutes. Sturdy steel frame and 420D oxford water-resistant fabric offer resistance and protection in all weathers. Comes with anchoring pegs and cords for extra stability; a carry case ensures a compact storage and transport. Side walls provide protection from wind or can be removed to enjoy the summer breeze. The walls are made of 210 oxford fabric. Product quality is guaranteed by a 2-year manufacturer’s warranty. Rain water tends to gather on the roof and it’s difficult to drain off. Although it doesn’t leak, its weight might damage the structure. The fabric is not properly reinforced in the corners and the metal frame can tear it. Velcro straps on the side walls are not of the best quality. Lorca gazebo is stylish and elegant, available in five colours and perfect for outdoor parties. The product comes with a sturdy powder-coated metal frame and a water-resistant roof canopy with an air vent. Matching side panels add elegance to the structure while the design is reminiscent of a Japanese pagoda. Ideal for residential use but also suitable for commercial purposes, this unit has a generous footprint and floor clearance. It measures 3m x 3m and has an overall height of 2.7m, while the 2m passage height is also generous. Roof braces, revetted feet and a powder-coated metal frame add robustness and resistance to the structure. Both the canopy and the side walls are made of water-repellent fabric and are easy to attach or take off thanks to the convenient Velcro straps. Ideal to use on the warmest days, this structure boasts an air vent that ensures an optimal air circulation. Assembling the gazebo is easy thanks to the secure plug connections while pre-drilled holes in the feet allow you to secure the party tent to the floor with screws. However, this is still a temporary structure unable to withstand storms or severe weather. Stylish design makes it suitable for most occasions, such as weddings, garden parties, barbecues or reunions. An air vent ensures proper ventilation in the hottest days, making the structure ideal for summer use. Lorca is available in five colours to match with your landscape. Choose from cream, anthracite, brown, Bordeaux red, or blue. Secure plug connections make the structure easy to assemble. Canopy and side panels are provided with Velcro straps for a quick and easy attachment to the frame. The structure doesn’t have side walls and this might be inconvenient if you live in a windy area. Instructions are written in German while the diagrams are too small and hard to follow. Greenbay’s Sand Metal product finds its ideal place in an elegant property. 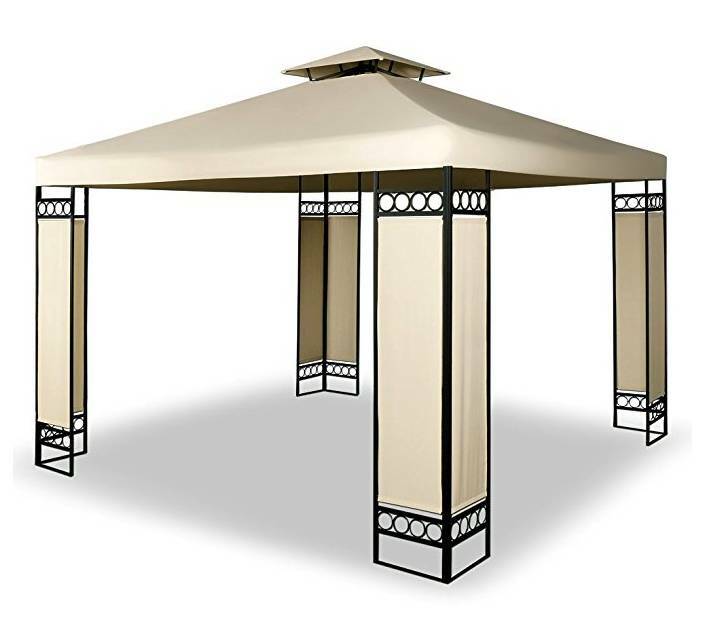 It has a stylish steel structure and a classy sand-coloured two-tier canopy. 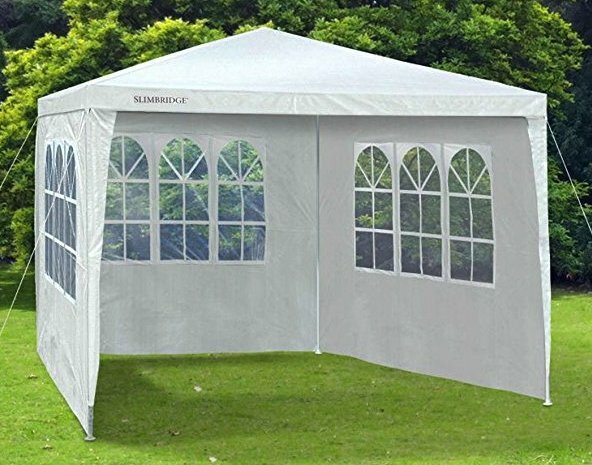 With a 3m x 4m footprint and a 2.8m overall height, the party tent is spacious enough to accommodate various outdoor events and gatherings. 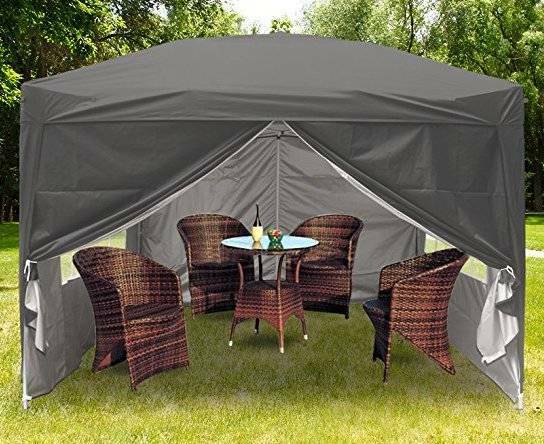 The canopy is made of durable PA-coated polyester fabric. The fabric blocks both harmless UV rays and annoying rainwater, protecting from all elements. Removable sidewalls shelter from wind and allow a better temperature control in the coldest days. The frame is made of circular steel support tubes with a diameter of 75mm. Eight strong ribs add stability to the unit and turn the gazebo into a secure shelter. The fabric is easy to remove and easy to clean. We like the rain hole in the roof which ensures a quick and efficient drainage of the water. Rain accumulation will not be a problem with this gazebo. The generous interior makes the product suitable for many events, such as weddings, barbecues, garden parties, and more. 75mm diameter circular steel tubes and 8 support ribs provide stability and robustness to the structure. PA coated polyester fabric blocks harmful UV rays but also rain; this gazebo provides shelter in all weathers. A rain hole in the roof ensures an efficient drainage while the two-tier design ensures proper ventilation. Roof and side walls are easy to remove for washing. Guy ropes and ground pegs are not included in the box; these would have been a nice addition. Assembly instructions are poorly made, hard to follow and only comprise tiny diagrams. Despite being made of a water-resistant material, the roof doesn’t withstand heavy rains. Redstone gazebo is an affordable structure made of quality materials and designed to withstand light wind and rain. However, don’t expect it to withstand storms, strong winds or adverse weather conditions. Nevertheless, this is a splendid pavilion to use in summer. It measures 3m x 3m and its generous interior provides sufficient space to let you enjoy the outdoors without rendering yourself vulnerable to the sun. The frame is made of sturdy steel poles while the polyethylene cover consists of a green roof, green and white legs, and striped green and white side walls. Velcro fasteners on side walls ensure a fast configuration of the unit. When all walls are on, light floods into the structure via large church windows located on two panels. In the hottest days, it’s easy to remove all side panels and enjoy easy access from any direction. We really like the 32mm diameter leg poles which are about 50% thicker than standard. Together with the included guy ropes and ground pegs, they ensure a superior stability compared to similar products. We also like the green roof, which blends wonderfully into the landscape. Sadly, it’s hard to say the same about the green and white legs and walls. While they look great in a casual setting or at a fair, they are hardly suitable for a formal party or gathering. Assembling and dismantling the product is easy, and the product comes with a convenient carry case. Weighing only 11.5kg and folding compactly, this pavilion is easy to store or transport. Comes with guy ropes and pegs which add more stability to the sturdy structure. Removable side walls add versatility to the structure. Remove all walls for easy access from all directions or use them as wind shields. Stability in moderate or strong wind is poor even when the pavilion is secured with ropes and pegs. Velcro straps are flimsy, short, and they break easily. Although easy to put together, the product is still more difficult to assemble than a pop-up gazebo. Outdoor events often require shade and shelter for the attendees, and a pop-up gazebo often provides the perfect coverage. These structures are lightweight, portable and designed to put together with little or no construction knowledge. Pop-up marquees are easy to install on almost all surfaces, such as grass, decking and even paved roads. If you want to place it in a small backyard or terrace, measure the area before deciding which product to buy. Standard units measure 3m x 3m but it’s easy to find smaller or larger tents. Also, make sure to locate the structure at a distance from trees and bushes, as hanging branches might damage the canopy. We recommend installing the unit on flat terrain for improved stability. If possible, try to level the foundation by filling any lower areas with dirt. Almost all temporary structures come with instructions which might hold essential set-up information. We know that not all manufacturers include comprehensive guides but they will still explain which parts are included in the box. 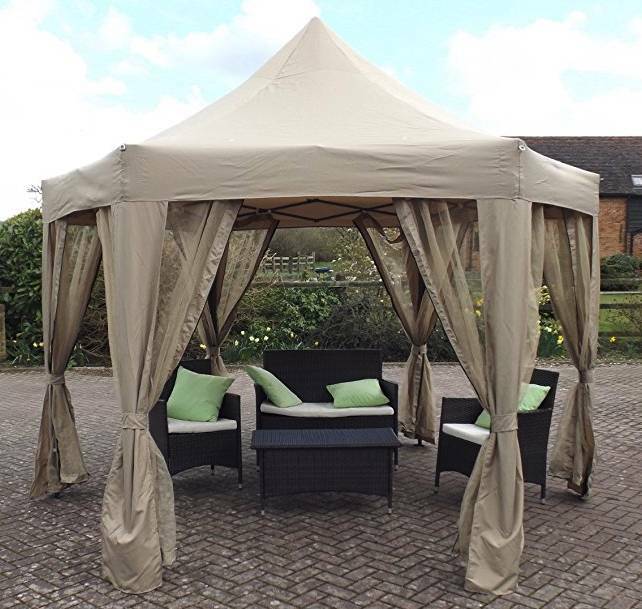 Pop-up gazebos usually require no tools to set-up and the frame just fits together smoothly. Some instruction manuals offer details on how the structure locks into place, but most of the time it’s enough to simply use your common sense. Although it’s not complicated, setting up the frame is usually a two-man job due to the size of the structure. Most marquees come with an integrated canopy which is attached to the frame by the manufacturer. However, in some cases you may happen to receive a detached canopy that should be secured into place once the frame has been erected. If this is the case, unfold the canopy and lay it down. Pass one edge over the top of the frame to an assistant sitting on the opposite side, making sure to stretch it and remove all creases. When the canopy is in place, secure it on the frame as instructed by the manufacturer. Pop-up structures usually come with removable side walls that are easy to attach to the frame with Velcro straps or snaps. Designed as temporary and portable structures, pop-up gazebos are lightweight. This means poor stability and resistance. For this reason, it is recommended to reinforce the structure with additional weights placed on the legs. Some products come with guy ropes and ground pegs, or pre-drilled legs which allow screwing the frame in place. Gazebos are useful and attractive structures, which makes them easy to incorporate into any garden design. 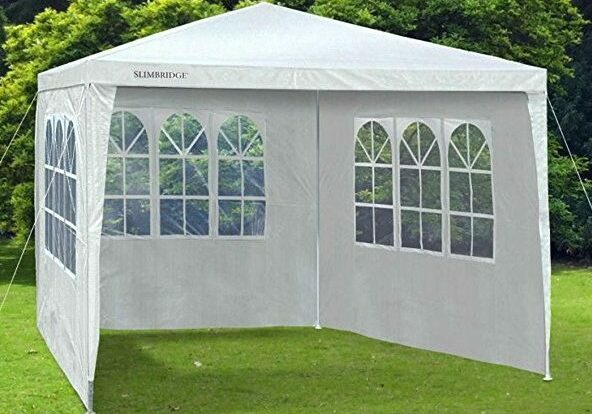 Protecting from the elements and providing shade in the sunniest days, a marquee can give you the right excuse to spend more time in your garden. Don’t let the unexpected showers and lousy weather keep you indoors this summer. Arrange an outdoor dining area under a pop-up unit. An UV-proof canopy will protect you from both harmful rays and light rain, while side walls won’t let wind or insects bother you. If you want to enjoy the breeze, choose a marquee or pavilion with mesh walls. A rectangular structure is perfect for protecting a Mediterranean lounge area. Install the structure on a flat terrain, preferably on a deck or patio. Choose rattan furniture, cosy cushions and add the final touch with a colourful carpet. Outdoor lighting such as lampions will not only beautify this area but will make it more enjoyable in the evening. Pop-up products are perfect to cover a hot tub, but you can take your relaxation to the next level by arranging a true outdoor spa. Install a large pavilion over your hot tub and furnish the area with design loungers and a massage table. A design coffee table decorated with candles would truly complement the design. If you love hosting garden parties, or just want to celebrate life with your friends in a beautiful setting, arrange your party in a hexagonal gazebo. Wooden or rattan garden furniture are your best bets to complement this beautiful look but make sure to have plenty of seats and sufficient coffee tables. Use this area to host an afternoon tea party, family reunions or gatherings with friends. If you have an outdoor pool, use a gazebo to create a cosy relaxation area on the poolside. Some come with integrated swings, or you could place a large beach bed under the canopy. Either way, lazy lounging on a sunny afternoon is guaranteed.